UK, 1998, 112 minutes, Colour. John Hurt, Christian Bale, Daniel Benzali, James Fawkner. Together, the couple save animals – until at last there is a violent confrontation with the pursuing stepfather. Christian Bale, ten years after his extraordinary debut in Steven Spielberg’s Empire of the Sun, had begun to build a strong film career. He was to appear as Bruce Wayne in Batman Begins in 2005 and achieve some international reputation. The reliable John Hurt is the strange recluse. Daniel Benzali, from the television series Murder One, is a very sinister stepfather. Direction is by producer Jeremy Thomas, a producer who has made a number of significant films including the films of Bernardo Bertolucci, winning an Oscar for The Last Emperor. 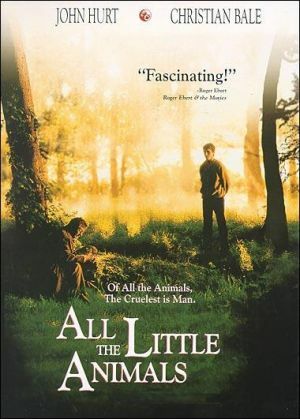 1.The impact of the film, the drama, character study, animals and nature, violence? 2.The work of Jeremy Thomas, producer, directing debut? 3.A portrait of Britain, life in the city, the contrast with the roads, the countryside, the world of nature in the English countryside? The musical score? 4.The title, its focus, Bobby and his animals? The road-kill? Mr Summers? and his animals? The relationship between animals and humans? Saving animals? Human violence towards animals? 5.The portrait of Bobby and his story? Seeing Bobby as a little boy, his love for the animals the accident, his parents, the family, at home? His mother and her grief? His memories? As he grew up, mentally impaired? His mother and the stepfather? His nickname of The Fat? The shop, owning the shop, his tyrannical behaviour, sinister presence? The legal aspects of the documents, the lawyer, the arguments and the pressure? 6.The Fat and his treatment of Bobby, his voice and scorn, the animals and their death? Bobby and his running away, bewildered on the road, getting the lifts, experience on the roads? The crash and the hitting of the animal? 7.The picture of Mr Summers, Bobby meeting him, the initial reaction, talking, the antagonism? Mr Summers’ story, his killing, regrets or not? His relationship with the animals, living in seclusion, his house? What he considered his vocation and work? Bobby and his getting to like Mr Summers, the offer to him to help, Mr Summers teaching him, their out on the roads, collecting the animals, burying them? The growing friendship? 8.The beach, Mr Whiteside and his character? 9.The religious dimension? Mr Summers, De Winter? Spurning him, the throttling, his going back? Mr Summers and death? 10.Bobby, The Fat, the irony of the contrast between Winter and Summers as name? The Fat and his trap? The pursuit? The car? Bobby’s shrewdness? The shaft and his death? 11.Bobby, left with the animals? The affinity between the two? His future? 12.The atmosphere of menace throughout the film, with de Winter and his attitudes and behaviour, his sinister manner and action? The contrast with Summers, his sense of menace, his past, the relationship with Bobby? Death? The story and the telling of the story about humans and animals?